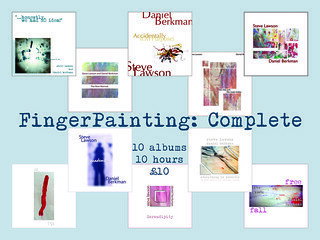 So before we get to the main bit of the blog – here’s a special £10K offer – all 10 FingerPainting albums to download for £10. Click here to buy. Which brings us to point one: Milestones are wholly arbitrary, but any opportunity to be grateful, to take stock and to measure where you’re up to with any kind of consistent data is to be welcomed. I’m massively proud of it, and its existence is a more meaningful milestone than the money it made. Still, 10 grand from one sales platform at a time when ‘no-one pays for music anymore’… what does that mean? For many others struggling to get ANY sales on Bandcamp at all, this will look like an impossibly huge figure. So maybe it needs a bit of exploring. Firstly, it’s worth noting that my music career didn’t start with Bandcamp. As you should know by now, I’ve been playing solo since the late 90s, my first solo album came out in 2000, and my first 3 solo CDs are sold out. Each was a production run of a thousand, so after ones that were given away, that probably means 700-750 sales, at for the most part about a tenner each. minus the approx 2 grand it cost to manufacture each lot of 1000 CDs, and the fact that I put out one solo album every 18 months – 2 years. In the last year on Bandcamp, we sold 1461 albums. That’s counting all the individual albums sold on USB sticks, or in 10 album download sets. So the unit value of each ‘album’ is way down, but the unit cost of each one existing is in one sense zero. No further transaction needs to take place for me to be able to sell as many albums as there are people interested in buying it. None of the music will go out of print, even as we sell out of the CD and USB stick versions. That £10K also includes a handful of gig ticket sales – probably £150 or so. The option to now sell tickets in the same place as the music is pretty useful. We like that. It also includes CDs and USB sticks obviously, but doesn’t include the postage charges for those – they’re added on the top. It also includes Bandcamp’s cut – which was 15% until we got to the point of making $5K a year, then dropped to 10%. so that’s somewhere between £1000 and £1500 of the total. the USB sticks have so far cost us about £850, and CD duplication in the last 4 years runs to around £500. So what does that £10K mean? Is it wages? If it is, it’s not much of a milestone. Should it be measured against what other artists are making? That seems a bit meaningless, given the role that marketing (and marketing budgets) play in headline figures. There are going to be a LOT of acts – signed as well as unsigned – who will see FAR less than we do go into their bank accounts from sales while still grossing WAY more than we do. Because, making money from music costs money. And for MOST artists, it costs more than it makes. I could probably sell a lot more music if I assigned myself a sizeable advertising and promo budget, if I was willing to do a buy-on tour opening for a bigger name act… but I just can’t afford to do that. That would cease to be sustainable. So I spend what I have – which is time – and use it to tell stories, to present the music is as many different contexts for as many different audiences as I can. For about 80% of my Bandcamp sales, I can tell you where the person heard about me, because I’ve been in touch with them already. It’s an extension of myriad friendships, not the effectiveness of an ad campaign that has bred whatever success we’re looking at here. Anyway, thank you all SO much for your part in this – making music and spending enough time on it that it precludes doing other work is a precarious choice of profession, but it’s one that results in us being grateful every time the ‘cha-ching’ emails arrive from Bandcamp, knowing we can transfer that money out of Paypal and into our bank and pay some more bills, and spend a little more guilt-free time getting better at the music that so many of you choose to soundtrack your lives with. That’s an epic privilege, and one that I’ll never take for granted.